On January 26-27, UNAVCO education specialist Becca Walker worked with middle and high school Earth science teachers at the IRIS Consortium's Yuma Union School District Earth science teacher professional development project. Held at Cibola High School in Yuma, AZ, the workshop was designed to improve and align Earth science instruction in grades 7 and 9/10 and included activities by IRIS, UNAVCO, Boston College, Purdue University, and SCEC. 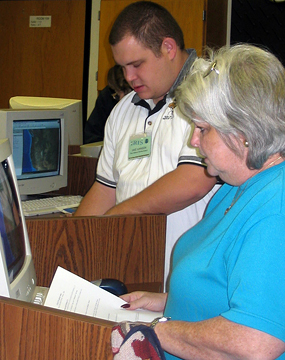 Walker introduced teachers to high-precision GPS and led an activity in which teachers used UNAVCO's Jules Verne Voyager Jr. map tool to observe spatial relationships between earthquakes, volcanoes, and plate boundaries in the western United States. As a result of this workshop, participating teachers had hands-on experience using Jules Verne Voyager Jr., gained a greater awareness about high-precision GPS and UNAVCO's mission, and discussed incorporating the Voyager and geophysical data into their teaching. Discussions about a GPS installation in Yuma were also initiated with the Cibola High School science department head. We look forward to continuing to build relationships with Yuma Union School District faculty and administration and thank IRIS for the opportunity to contribute to the workshop. An article on the workshop from the January 29, 2006 edition of the Yuma Sun can be found here. Yuma science teachers use the Jules Verne Voyager Jr. map tool to compare locations of earthquakes and volcanoes in the western United States. The UNAVCO education and outreach team continued its teacher professional development efforts on February 16 on the University of Portland campus, Portland, OR. Middle and high school teacher participants were alumni of Teachers on the Leading Edge, a field-based professional development program for secondary Oregon Earth science teachers. 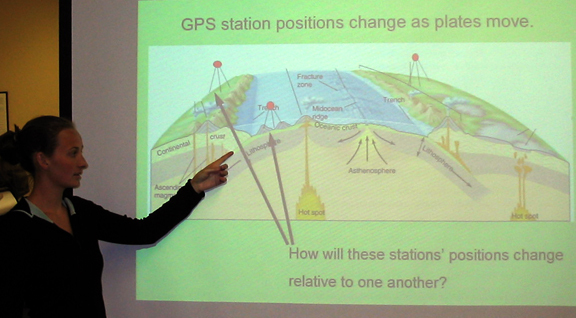 Following an introduction to high-precision GPS and a Jules Verne Voyager Jr. map tool activity, UNAVCO education specialist Becca Walker facilitated a focus group discussion with teachers to solicit feedback about the types of GPS-based educational materials that would be suitable for their classrooms. UNAVCO thanks Dr. Bob Butler, University of Portland and Teachers on the Leading Edge co-principal investigator, for helping to coordinate the afternoon and the teacher participants for volunteering their time and professional expertise. We are excited about future collaboration with the conveners and participants of Teachers on the Leading Edge. For more information on Teachers on the Leading Edge, visit their website, http://lewis.up.edu/TOLE//index.html. UNAVCO education specialist Becca Walker introduces teachers to the use of high-precision GPS to measure plate tectonics in Portland, OR.